Tory Historian's duty would not be fulfilled if there were no mention of the England World Cup win on July 30, 1966. Not a particularly conservative occasion, unless we count the game (actually it is not all that beautiful) one of this country's traditions, as it happened under a Labour government who proceeded to take credit for it. Harold Wilson was a spin doctor on a level to which Tony Blair can only aspire. Let the row about those two goals begin. Tory Historian will take no part, though remembers watching the game. The anniversary is sandwiched between two that appeal to Tory Historian a great deal more. July 29, 1588 was when the Spanish Armada was sighted off the coast of Cornwall and the English fleet under Admiral Howard and Sir Francis Drake (who had, presumably, finished his game of bowls) set out in pursuit. July 31, 1667 is an even more important date for England and the Anglosphere. The Second Anglo-Dutch War ended with the Treaty of Breda. The Dutch lost Delaware and New Jersey and New Amsterdam was renamed New York. The Dutch empire in North America did not happen. The BBC has its uses. Not many, admittedly, but it is useful to find out that July 22 is the anniversary of Sir Alec Douglas-Home's resignation from the Conservative Party leadership. It seems many MPs were surprised by his decision, taken during a week-end in Scotland, and blamed the relentless campaign conducted against him by the media. Hmmm. Sounds vaguely familiar. Sir Alec was lambasted for being a toff, for having mild manners, for seeming out of date, for being an idiot. The first two were certainly true. What the media could not explain was why a toff with mild manners who is completely out of date and is also an idiot nearly managed to swing the election in the Conservatives' favour, after a number of unpleasant scandals, and as the next Prime Minister, Harold Wilson, liked to say, "thirteen years of Tory misrule and incompetence". Sir Alec's successor was to be chosen by an electoral procedure, for the first time in the Party's history, a procedure put into place by him. The two main candidates were Reginald Maudling and Edward Heath. When asked, Sir Alec refused to offer support to either and explained that he would be happy to serve the Party in any capacity under any ruler. I don't recall his successor making such promises. There are some people in history who fill Tory Historian with a deep sense of inadequacy (OK, less of that sniggering at the back). 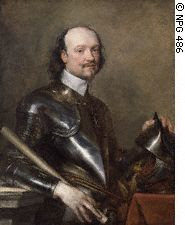 Today's birthday boy, Sir Kenelm Digby, is one of them. A man, who managed to be a Catholic, an Anglican and a Catholic again; a courtier to Charles I and Charles II but also an emissary from Oliver Cromwell to the Papacy; a sailor, politician, dueller, scientist (one of the earliest members of the Royal Society); a famous husband and widower of a lady of doubtful virtue, Venetia Stanley; he was also a man interested in cooking, spirit-making, preserving, candying and the creation of lotions and potions. His recipes were collected after his death by a servant and the ‘The Closet of the Eminently Learned Sir Kenelme Digbie Kt Opened: Whereby is Discovered Several ways for making of Metheglin, Sider, Cherry-Wine, &c. together with Excellent Directions for Cookery: As also for Preserving, Conserving, Candying, &c.’ has remained one of the most entrancing historical cookery books in the English language. 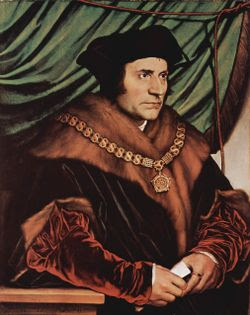 Sir Thomas More, former Chancellor of England and particular friend of Henry VIII’s was executed on July 6, though it is not clear from the accounts whether this is according to the Julian or the Gregorian calendar. More was, as mentioned in a previous posting, one of the people who had helped to create the malign image of Richard III, undoubtedly because of his loyalty to the Tudor dynasty or, at least, Henry VIII. Tory Historian recalls teaching history of political thought to some students many years ago, in the course of which Thomas More’s “Utopia” was discussed and being somewhat astounded to read an essay in which the student in question maintained that it was that rather turgid novel that brought about the author’s fall from favour and eventual demise. That would have been an interesting theory to propagate. It is worth remembering that More remained loyal to the King for a very long time, even accepting that Parliament had the right to proclaim Anne Boleyn as Queen. It was the need to swear to the Act of Succession and, above all, the Act of Supremacy that put the King at the head of the English church that he found impossible to square with his conscience. More was, in many ways, a much more interesting character than the one in Robert Bolt’s play, “A Man for All Seasons”, even as portrayed by the great Paul Scofield. A learned man, an enlightened man, a humanist, he was, nevertheless, ferocious in his hunt of all “heretics” and determined that they should suffer torment on earth as a foretaste of eternal torment in hell. Tory Historian, being an Anglospherist, takes the view that the Declaration of Independence and the subsequent war was, in actual fact, another civil war within the English commonwealth, the last act of that struggle between autocracy and liberty that started in the 1640s and continued through the 1680s. 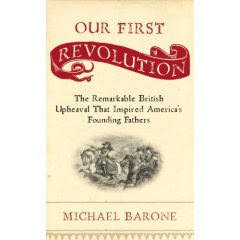 A recent book by Michael Barone, the well-known American political analyst, “Our First Revolution”, deals with that theme through a history and discussion of the 1688 Revolution. Here we run into a difficulty for it was a Whig Revolution. In the case of the American Revolution, political opinion was divided in Britain not according to party lines in so far as there were set political parties at the time. The great hero of conservative thought, Edmund Buke, famously supported the colonists. Others, such as Dr Johnson, were more sceptical, to put it mildly. Given the important part played by Virginia plantation owners in those events of 1776, this remains an important and hard to answer question. 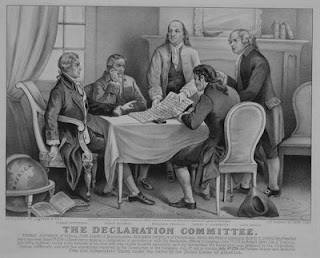 James Rummel defines Fourth of July on Chicagoboyz while Rick Moran on Right Wing Nuthouse “liveblogs” from the Continental Congress.